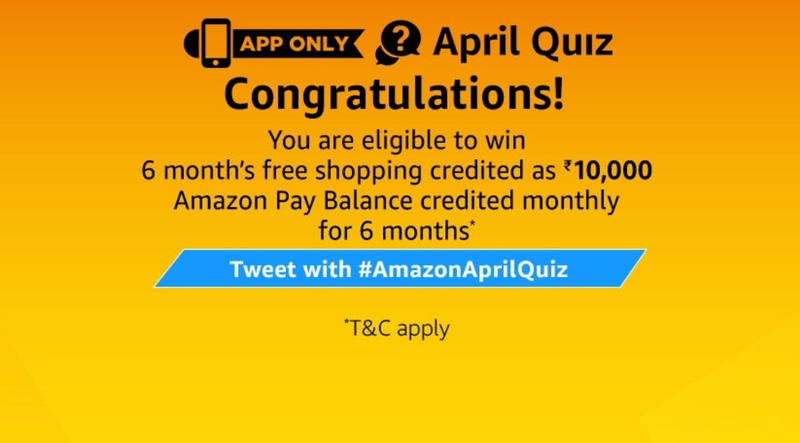 Amazon April Quiz – Hi Guys, Amazon is back again with another quiz and in this Time Prize is Big & Quiz is Simple, You Will Get 6 Month Free Shopping In This Amazon April Quiz. 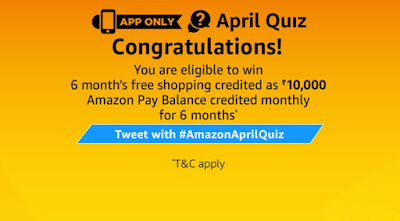 Now Here is Exclusive Chance To Win 6 Month Free Shopping From Amazon By Playing April Quiz Of Amazon. In This Amazon Quiz Of April, All You have to do is Give Right Answers to All 5 Questions & If You are Lucky Enough Then You Can Win Free 6 Month Free Shopping. Q1. In Italy, France, Belgium & Canada, April 1 is called ‘April fish’ & includes trying to attach a paper fish to the victim’s back without being noticed. Q2. 14th April is celebrated as the birth anniversary of Independent India’s first law minister. What was his name? Q3. April 17th is also celebrated as the day to stop procrastinating, dust off resolutions and making another start at them. What is the day called? Q4. The April Lyrids last from April 16 to April 26 each year. What are they? Q5. Which of these is a western zodiac sign associated with April?